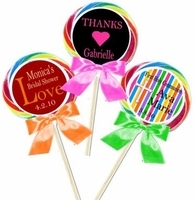 Personalized Lollipops are the perfect party favor for both kids and adults. 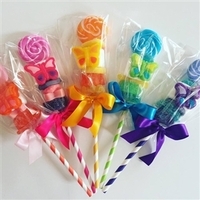 No one can resist a jumbo swirl lollipop, bursting with festive colors and delicious flavors! 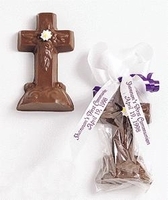 Chocolate lollipops are also a favorite. We use only the finest chocolate for a deliciously creamy chocolaty treat! 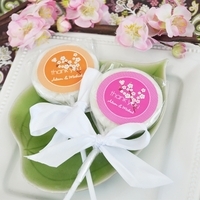 Our white lollipops are pretty and elegant. 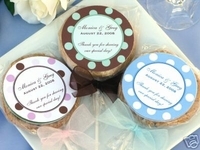 We offer a wide variety of lollipop label designs for all of your special occasions. 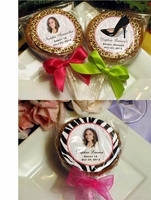 Our personalized lollipops are so SWEET and delicious, your guests are sure to love them! Choose one of our festive designs or you can work with our designers and create one of your own...free! 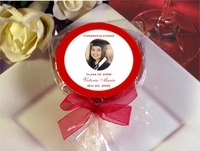 Our lollipops can be personalized with names, dates, events, company logos, and even photos. 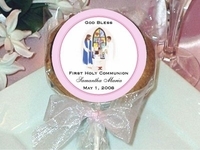 Our personalized lollipops are perfect for birthday parties, First Holy Communions, baby shower Favors, wedding favors, sweet 16 favors, quinceanera favors, graduation party favors, and holiday favors! We have so many stylish and trendy labels to choose from. We promise you - they will be the talk of the party! So pretty, unique and so elegant!